This app is available for Apple, Amazon, and Android from the various stores. Occupational first aid assessment report application for first responders. Log first aid events in accordance with standard occupational first aid reporting (which includes incident description, vitals, the Glasgow Coma Scale/GCS, treatment, referral, etc). 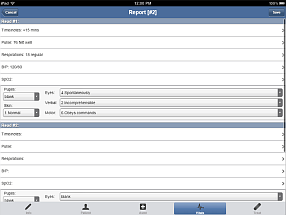 This app is a simple electronic patient care report (ePCR) specifically for first aid responders. Log the first aid reports to review at a later date, as well as, generate a copyable text version of the report so that it can be pasted into other applications (such as a secure email, eHealth record, etc). This app does not store data outside of the phone. It doesn't require any subscription services.